Everyone running a fairly popular blog knows about the problem with comment spam. To put it short, bad people polute the comment forms on blogs to spread links and commercial info about their products or web sites. I have been using several plugins to fight the spam, but lately the preassure from the “spam bots” have increased to a level where it puts preassure on the server I am running. I don’t like to let my readers down by making it difficult to comment, but I am now forced to install a small trick to verify that it is real people and not a robot that tries to leave a comment. I have decided to put the small piece of work you have to do when you verify yourself into a good cause by using the reCaptcha plugin to verify real humans. 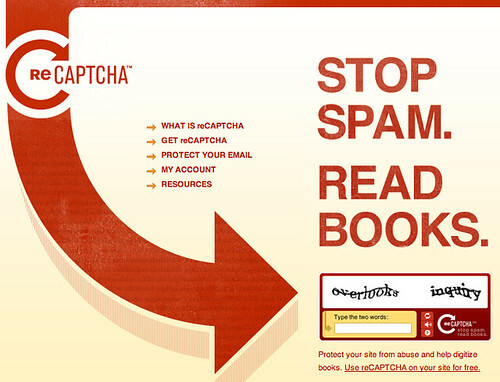 reCAPTCHA asks commenters to read two words from a book. One of these words proves that they are a human, not a computer. The other word is a word that a computer couldn’t read. Because the user is known to be a human, the reading of that word is probably correct. So you don’t get comment spam, and the world gets books digitized. Everybody wins! So, feel good when you put in that extra bit of work to be able to comment! And yes, I have to test this plugin myself! A little contribution to what ever book! But can I read these books or do I have to buy them? So now you have both Akismet, Bad behaviour AND reCAPTCHA? Yes. I am currently running three levels of protection from that horrible comment spam. Did you read the interview of Luis von Ahn in the July edition of Wired? That is one smart man! Here’s an online version for those who haven’t read it: For Certain Tasks, the Cortex Still Beats the CPU. 28year old professor. Hmm. 28 years. Professor. Yes, smart man. And interesting article indeed!